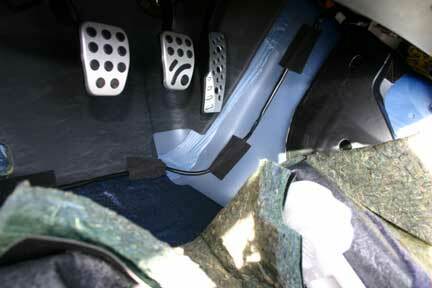 The first modification came less than a month after signing the paperwork for the car. I hadn't even made the first payment yet. 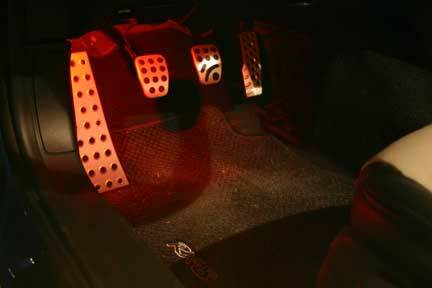 This mod was to add the Mazda Night Lights (Foot Lamps) (Mazda part number F151 V7 050). Total install time was about 2 hours, including disassembly and reassembly of the car. If I were to do it again, I could probably do it in less than an hour (much of the time was spent learning how to take the car apart). Over all, the instructions included with the kit were quite good. My only complaint was that it was not obvious where they recommended installing the driver's-side light. Electrical harness attachment. This picture was taken from the driver's side floor looking toward the outside of the car (the edge of the body can be seen in the upper left of the picture). The two large rectangular black plastic pieces on the left are the fuse boxes. The electrical install included two 3M in-line splices (wrapped in black electrical tape, just below and left of center), an in-line fuse holder (white cylinder lower center) and a timer (grey box just above fuse holder). 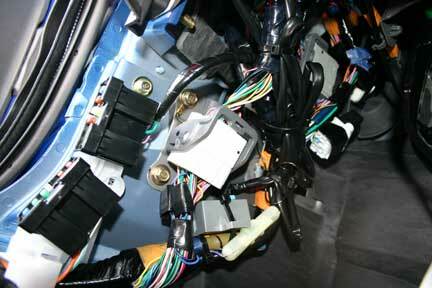 The fuse holder, timer and the excess wiring harness are wire-tied to the main wiring harnesses in this area. Driver's side lamp install. This picture was taken from about the same location as the above one, but with the camera tilted up at about a 75-degree angle looking up under the dash (the bright white on the left side of the picture is sunlight coming in the open door). The Night Light is the red/yellow illuminated piece below and left of center. The lamp is attached with two-sided tape. For orientation, the handles above and left of the lamp are the trunk release and hood release. This was as close to the recommended posistion I could get it. If I did it again, I would suggest maybe moving it down a bit so it is not so blocked by the trunk release. 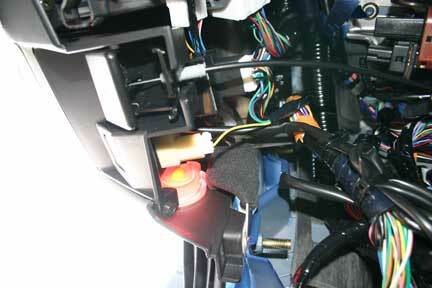 Wiring harness running across the driver's floorboard, over the hump to the passenger side. Black foam tape was included with the kit. Passenger's side lamp install. 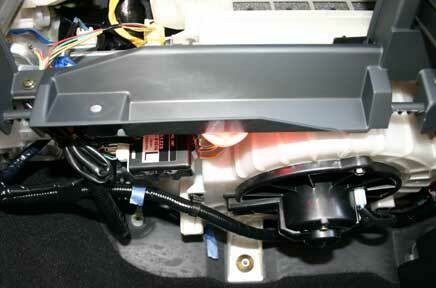 The long rectangular grey plasic piece in the center is what the glove box is attached to, and the large white toroidal piece is the blower motor/fan. This picture was taken from the floor in front of the passenger's seat looking up slightly. Lamp is barely visible, being attached to the back side of the glove box support and just peeking under the lower edge. 6-second time-lapsed picture of the driver's side after install. 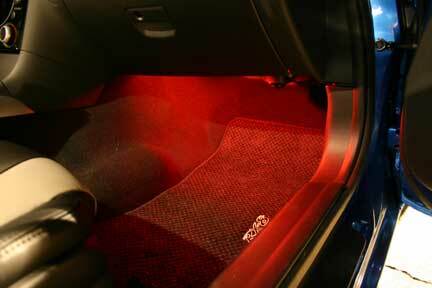 Moving the lamp down further (as noted above) would probably increase the amount of illumination in the footwell. 6-second time-lapsed picture of the passenger's side after install.